2/9/93 – Pauline left Sean to the playschool – he didn’t want to go in; she had to stay with him for a while and then sneak off. But when she collected him it turned out that he’d had a great time. He now has a schoolbag, which she bought him yesterday, for carrying his lunch in … [later] Sean and I went to the shop for sweets, him on his bike. He went to sleep quite early. 4/9/93 – Sean and I went to the shopping centre for the paper and bread, which he transported home in the tipper of his bike … [later, in Naas] We had a barbecue and wine, and John and I also drank some cans of beer. Blanaid arrived quite late with Hannah and Daniel – she and Daniel left again after a while. Sean had a good time running around with the two kids. 18/9/93 – We all went down to Dundrum. Sean went to the crèche, Pauline and I spent an hour reading the Guardian in Bewley’s. Then we did the shopping and came home, with Pauline and Sean running from one manhole cover to the next. I cooked pasta with ham etc. for dinner – Sean ate well. In general, he is still not a good eater, but shows no signs of this. 22/9/93 – Sean was awake at some unearthly hour. It seems he had bad dreams – he was talking about dinosaurs and lions eating himself and Pauline. 4/10/93 – Got a bus into town; walked from Stephen’s Green to Connolly. Soon discovered that the Belfast train was an hour late, so I strolled to Mulligan’s, had a pint of Guinness and strolled back. Met Pauline and Sean – Sean had slept a bit on the train. They had had a pretty miserable time – waiting for an hour and 20 minutes on the platform at Newry. Pauline had been freezing; Sean at least was wrapped up well. 5/10/93 – Sean slept in his own cot until after 9! This was quite amazing, and extremely welcome … Pauline took Sean to playschool in the pouring rain, and had to stay with him a while and then sneak off. She collected him in the pouring rain also – it was a horrible day. 7/10/93 – Pauline and Sean went to the ICT playgroup beside Wesley, because Sean has turned against the playschool … Triona, the prospective babysitter, called. She seems very nice. 9/10/93 – We all went down to Dundrum – Sean made friends with a black and white pussycat on the way … [later] Triona duly arrived at 8.30, and after giving her some instructions Pauline and I went out … We had two games of 10-pin bowling in Stillorgan … We had a drink in the Stillorgan House, punctuated by loud shouting from those watching the Benn–Eubank fight, then got a taxi home. Sean had half woken up at one point, but had not caused Triona any trouble. 14/10/93 – This morning, a note from Triona was delivered with a £5 note. She felt we had paid her too much. 15/10/93 – We got a bus into town and a train to Newry. Sean slept part of the way. Dave met us, and we got a bus to his house first … Sean and Sian ran around and shouted like mad things, entertaining Keelin greatly. 16/10/93 – I took Sean to the playground in the park. We had a good time there. 19/10/93 – Pauline and Sean were at the coffee morning with Marnia and Brian, and spent a large part of the afternoon in the park – Sean had a great time in the playground. 23/10/93 – Triona duly arrived around 1.45, and Pauline and I went out to catch a bus into town. Sean didn’t make a fuss, fortunately – we had been worried that he would. We didn’t sneak out; we were open about it and said goodbye. We then had a good afternoon in town … bought two pairs of plastic glasses for Sean – he had been coveting mine (30p each), and a bow and two felt arrows for £1. Got home around 6.15 – Sean had been fine with Triona. It had been a beautiful afternoon, and they had been out for a walk. 26/10/93 – Eleanor, Paul and Alan arrived and took Sean off to the zoo. 1/11/93 – Pauline and Sean went to the doctor in the morning for her check-up – she and the baby are fine. 6/11/93 – Played with Sean and watched The Jungle Book (I never tire of it) before calling Pauline. 9/11/93 – Sean, Pauline and I had good fun playing – Sean and I had some rough-and-tumble on the floor, of the kind Pauline is no longer able for. She later said she’d enjoyed the evening very much. 10/11/93 – Pauline and Sean painted the livingroom side of the filled-in door. 11/11/93 – Sean had a great time in Wally Wabbit’s, playing with a young kindred spirit. Pauline made a salad for dinner and we had a quiet evening in, playing with Sean and so on. He’s in great form these days. 12/11/93 – Amazingly, Sean slept through to 8.25, so we all had a good sleep … [later] I painted the kitchen and back room ceilings, and Sean smeared some paint on the back room walls. 14/11/93 – Pauline and I started the wallpaper hanging in the back room, but were hampered by Sean and made slow progress. I took Sean to the park; Pauline went to the Nutgrove, wanting to be on her own for a while. Sean and I went to the playground, which was crowded, and had a good time. I had difficulty keeping him awake on the way home. 16/11/93 – Pauline thought that she was in labour [there is a long description of this momentous day; I’ll give just the most important part here …]. At 12.42, our baby daughter was born. We were both quite tearful, and very pleased that it was a girl. Pauline held her straight away. 17/11/93 – In general Sean has been very good, and has made no fuss over the absence of Pauline. I got us organized and we got a bus into town, i.e. Merrion Street. Called to see Pauline, and Sean’s new baby sister … Played with Sean’s present from his baby sister, a truck with dumper, loader and scooper. It didn’t yet have a battery. Sean seemed to like his sister well enough, and after a while began to stroke her head. 18/11/93 – We still haven’t decided on a name – as of now I advocate ‘Susanna’. 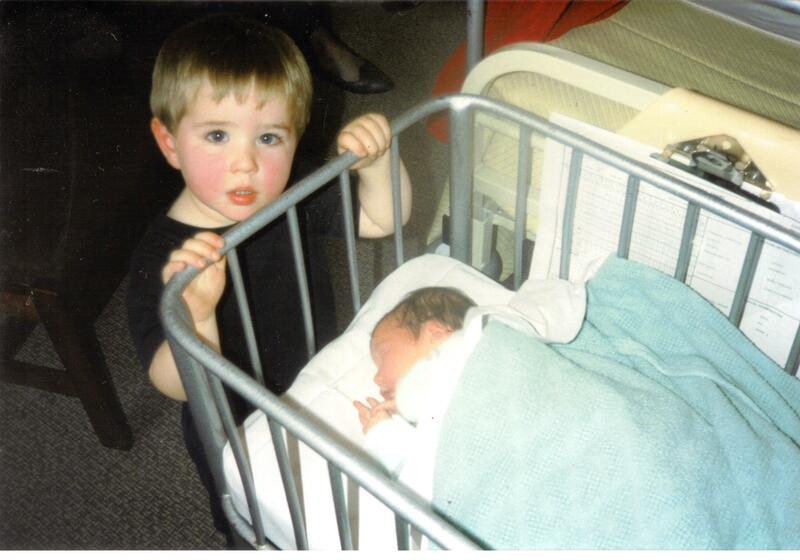 20/11/93 – Peter and Nuala arrived around 10.20. We left, all four of us, for Holles Street around 11.30. Pauline and Susanna were duly discharged and taken home. 22/11/93 – Susanna was no trouble, waking only for feeds and medicine. Everything seems more relaxed this time, more under control. 23/11/93 – Sean and I went to Bewley’s, and were engaged in conversation by a Christian Fellowship person from one of the Dakotas. 24/11/93 – Pauline and Sean went to the supermarket in the afternoon and Susanna slept/cried in her cot beside my desk while I worked. I now miss her when she’s not there – Pauline and I are delighted with her; she’s a lovely baby. Hello Brendan. Sean’s first day at playgroup brought back endearing memories of my own family. And I also share the joy you and Pauline felt at Susanna’s birth. Such precious memories. Hello Shermeen – many thanks for this. It seems like a long time ago now. This is just lovely, Brendan. No, I haven’t forgotten you or your family. I have just been involved in small and very precious little people of my own. My two grandsons are now growing up so fast. One is nearly three, and the little one was born at the end of August last year. Thank you, Araminta, and best wishes to you and yours. It sounds like you’re really making the most of your grandsons, which is great. It’ll be lovely to watch them grow. Do look in here from time to time.